If you are planning to build your own electric car from your home garage, you will need to purchase the parts and components. To help you with the sourcing process, I have compiled the list of top 10 electric car part suppliers on the internet. 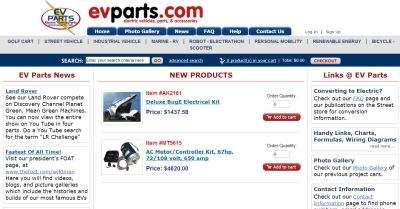 1) EV Parts – This company provides parts for electric golf cart, street vehicle, industrial vehicle, marian – RV etc. It’s main warehouse is located at 157 West Cedar Street, Sequim, WA 98382. 2) The Beeps Company – This company specializing in electric vehicle products with its main shipping store located in Clarkesville, GA.
3) KTA Services Inc – This company sells everything related to electric vehicle conversion from electric motor to adapter plate. KTA has been around since 1984 and is located in Ramona, CA. 4) Electric Vehicles of America – Has been around for more than 20 years selling electric car components. The company is located in Wolfeboro, NH. 5) Canadian Electric Vehicles Ltd – A Canada based company started as a hobby for Randy Holmquist, owner of Canadian Electric Vehicles in Errington, Vancouver Island. The company has been around since the early 1990s. 6) NetGain Motors Inc – The company is the exclusive worldwide distributor of WarP™, ImPulse™, and TransWarP™ electric motors for use in electric vehicles and electric vehicle conversion. It is based out of Lockport, Illinois. 7) EV Components – The company operation is based out of Lacey, WA. 8) EV Source – EV Source was founded in January of 2005 to provide goods and services to the alternative transportation and energy markets. The company is based at Logan, UT. 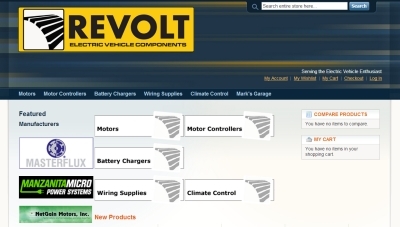 9) Revolt – The Revolt Electric Vehicle Components store is brought to you as a collaboration between the Revolt Electric Vehicles team, and Cara Fealy and Alyssa Farver. 10) Electric Motorsport – The company specializes in the sales and service of Personal Electric Vehicles as well supplying electric vehicle parts for EV Builders, Hobbyists, Educational institutions and Original Equipment Manufactures (OEM). Where would I get a blue print on building an Electric Car. One of the best EV conversion guide I have so for is Gavin Shoebridge’s Electric Conversion Made Easy manual. Thanks for sharing this information with us. This is very helpful for me because i have no source for buying parts from internet. Although the electric car is taking off around the world, we still use a donor car that was part of ICE design. What we really need is a mechanical design that is tailor made for the EV that can at good effiency convert the 95% efficiency into less loss mechanical interfacing with the wheels at highway speeds. This will (in my opinion) increase range and consequently popularity of the electric car.